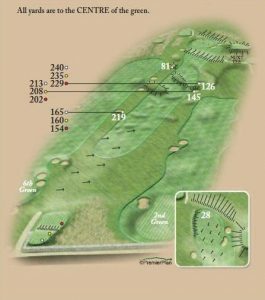 A fairway wood or iron off the tee ought to keep your tee shot on the fairway to the right of the mound and short of trouble. The marsh area to the right of the fairway is marked as a water hazard. A well struck medium iron will find the blind plateau green. To go through this green will guarantee at least a one over par.